100 mi ride/3 mi run A 6:00am meetup means we started pedaling around 6:15. This is my thrid 100 mile ride of the year. We had a group of Barry and Lisa Reiss, Sal and Suzanne, Erica, Erin and Izzy. We rode in shifting winds up the wet road to the lighthouse bridge. Barry and I stayed clipped in, I felt my rear tire sliding across the metal grating of the drawbridge whle Erica and Suzannne watched. They were concerned seeing this, so I made sure to tippy toe paddle across the next two bridge crossings. We made good progress up the island, a fake-out pit stop for the closed bathroooms at Bridge Rd, and then up to Sandsprit park for a quick bathroom break and eat. I think this is where Barry and Erin turned to ride home. 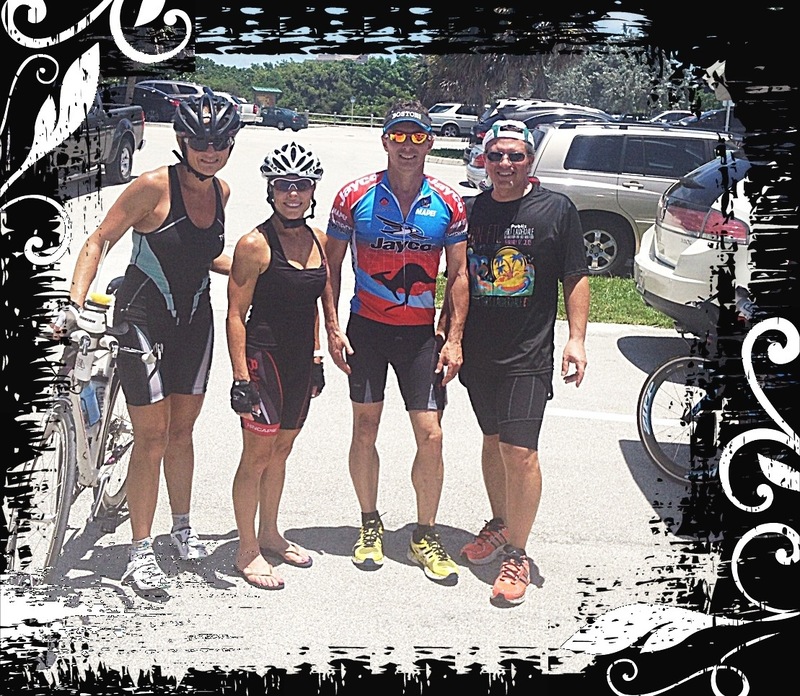 We rode to the Hutchinson Island bridges, crossed one and turned north to ride to the far bridge. We made that quickly as a grup, rode up it facing the breeze and the sun, then came down fast. The ride from that north bridge to the tiki hut gas station was against the wind, I tried to pull the group at a 20 mph or greater pace. This was good, I needed to feel the distraction of the wind and the annoyance that comes with it. At the tiki, I took my shoes off, my left foot is so succeptible to pain as of late. My seat isn’t much better, I found in the Motivation Man tri that I was shifting and repositioning looking for a good spot. Time for new pedals, shoes and a better seat for distance riding. I filled up my bottles, ate bars and used the men’s room. Erica and Izzy stayed for another loop of the north bridge, then they rode back with 75-80 miles behind them. The wind increased, Sal, Suzanne and I kept going for 4 full loops of the north bridge, which all counted includes 10 bridge causeway climbs. The latter loops got tougher, more wind, hotter temps and sun. 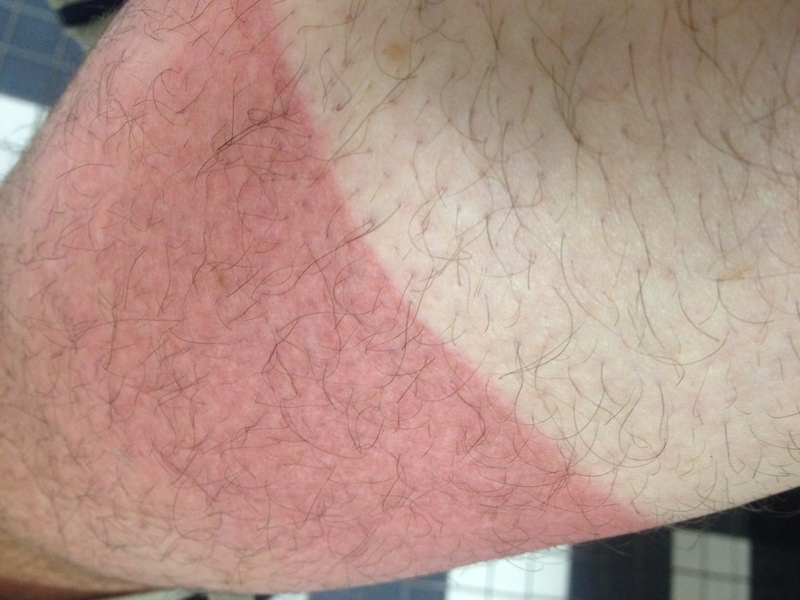 I pulled my cycling shorts up so as not to have the blazing red tan that starts at your knees. I completely underestimated the time I’d be out there, especially with mostly my left side facing the sun. I burnt my upper thigh badly with this decision. More sunscreen all over at 6am when I’m not thinking about it! I felt good nutritionally, I’m improving on what the drinks should include. I think for my body size, I’ve been making them too rich with Carbo Pro and whatever I’m using. It’s getting better. Our ride home was straight through. No stops, but as late in the day as we were, there were many cars, boats on trailers, etc. all over the roads. The three of us changed off pulling into a stiff 16+mph wind that came straight at us from the south. We needed to makup 1.5-2 mi so we turned into the Jupiter Inlet Park road to add some distance once past Guanabuanas. We also picked up ice at the Stuart Golf club for our water bottles. They turn warm very rapidly in the midday heat! We made our way south on A1A to Loggerhead park, Suzanne and I had matching Garmin mileage reports right down to the hundreth of a second. Lisa Reiss and Scott Simpson came in once we had loaded our bikes into the cars. I ran the 3 mile duck pond loop with her, very tired and thristy, but legs felt ok. We spoke about our respective races and training for events that will be half a world apart but separated only by a few hours. I showered in my cycling shorts at the beach shower, discovered I didn’t have my change of clothes pack in my car, and met Lisa at Moe’s for a big burrito. I was tired after this, definitely glad realizing Zurich will not be as hot, and feeling my endurance is good 7 weeks away fromt the race. I will do another 100 mile ride before and a longer run.